Classic pickup trucks are hotter than ever with collectors and enthusiasts. These classic workhorses are finding a new lease on life by the thousands these days. There's a huge demand for classic pickup truck restoration parts for these projects. 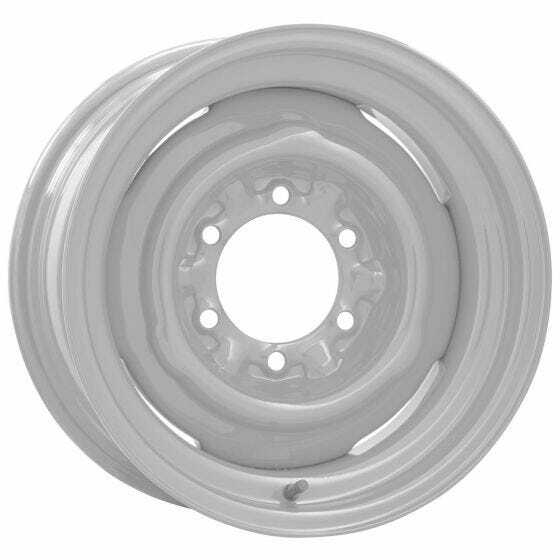 The OE 6 Lug Steel wheel is perfect for trucks from the fifties and sixties. It's built right here in the USA from premium quality steel using modern tooling. Offered initially in 15 inch sizes with 5 -10 inch widths, these great wheels are perfect for your classic truck project. These classic truck wheels will accept OE and aftermarket 10.125 inch caps. These wheels ship in a ready-to-paint primer finish. Do you accept personal checks or money orders/cashiers checks as payment? I do not hae a credit card. Thank you. Yes, we do! You may select "check/money order" as the payment method during online checkout, or give us a call at 1-800-251-6336 to place an order. Do these fit trucks equipped with disc brakes? In many cases yes, but it depends on the brakes. These each have a 13" drop center, so your brakes must not exceed this diameter with the caliper included. These wheels are special order and typically can be available 8-10 weeks after an order is placed.